Relive, replay, remember, resurrected and revived! RVGFanatic aims to commemorate the Super Nintendo from A-Z. The 16-bit era was the greatest time to be a video game fan, in my book, and this site aims to capture even the tiniest bit of magic from that very special period in gaming history. 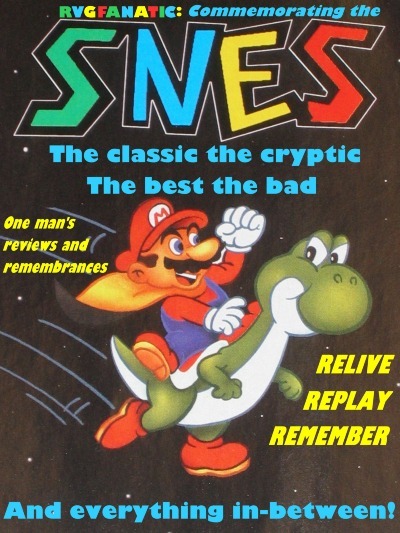 Join me for a nostalgic trip down memory lane as we explore the very best, the very worst and even the obscure games of the Super Nintendo’s vast library. And everything in-between! PS- See FAQ for site history and philosophy. Fighter’s History: Mizoguchi Kiki Ippatsu! Thanks StarBoy! I appreciate the love. I’m launching a special article later today in celebration of 10 years (putting the finishing touches on it as we speak). I can’t believe it’s been 10 years already. Everyone says that whenever they reach 10 years of something because it never fails to ring true. Cheers!